It actually says this in the lines that you quoted …“the first line (after #!/bin/bash)”. Just wanted to make sure, I’ve already spent more than 8 hours trying to fix my issue: Why is the Apple Touch Icon loaded via HTTP instead of HTTPS? I cannot load https://comunidad.wanderlancers.com/login to take a look as it appears you’re redirecting to a SSO provider. However, I can load https://comunidad.wanderlancers.com/u/admin-login and am seeing the secure padlock. If you click on the padlock with the warning icon, Firefox should give you more details. I’m really new to this, but I’m stuck at this stage and I cannot, for the life of me, rebuild! I cannot, for the life of me, rebuild! I’m using DigitalOcean and I do have access to the console. I got to this point and I just couldn’t do anything else! Forgive me: I don’t have any experience. I’m trying to start a discourse for my writing blog, haha! We used one of our email addresses for our domain. You could put your own email address in to start with then continue on with the build. I’m using Discourse on a one-click droplet by DigitalOcean. Is there any way to have certificates automatically renewed instead of having to do it manually every three months? I’m not very savvy. Thanks! What happens after discourse-setup takes your information and starts the rebuild? Does your domain name point to your server? Do you have something else in the way (e.g., cloudflare)? It was actually just a glitch with DigitalOcean! All sorted now! I contacted support and they walked me through how to fix it. There was actually no way to move on! These are literally you’re images that are causing the insecurity? I had uploaded logos prior and deleted all of them thinking that was somehow the problem but… nope… the discourse logos are now the problem… what’s going on? These are literally you’re images that are causing the insecurity? No, it’s because you haven’t enabled force_https. 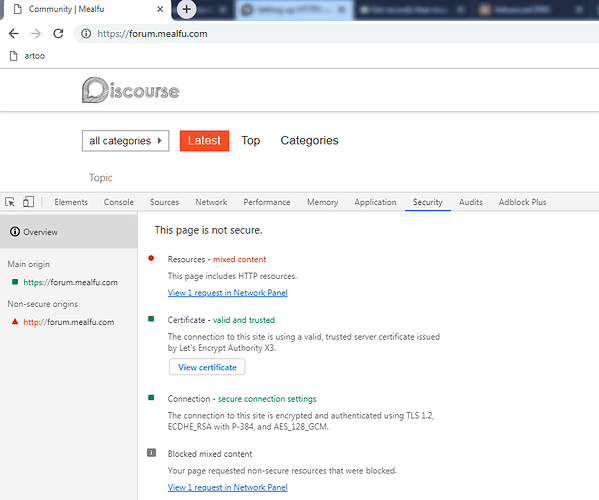 Once you do Discourse will refer to those assets using https. You need to enable that setting once you have configured https and tested it. It’s not automatic. Assuming you have admin rights. 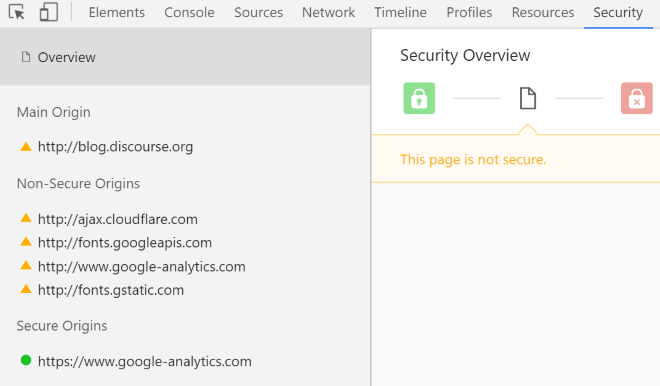 Check all your social logins and make sure they are pointing to the https:// and not http:// versions of your site’s authentication URLs. If you are using a CDN, you will need to switch your CDN to use https:// and not http:// to pull resources. You really might want to update that section to reflect the instructions for setting up HTTPS because apparently I did everything right but the current instructions make it seem like I did something wrong because the default images were causing an insecurity error. I just toggled Force HTTPS and everything works (the instructions had me thinking I was going to wreck my install because of “insecure” images). Anyhow, thanks again! I’m the new happy owner of a HTTPS Discourse!